In diesem Workshop wird das "FreedomBox"-Projekt vorgestellt, dabei handelt es sich um sogenannte "Plug Computer", die einfach an eine Steckdose angesteckt werden können und dann für mehr Privatsphäre und mehr Kontrolle über die eigenen persönlichen Daten im Internet sorgen sollen. So kann die FreedomBox beispielsweise gewisse Tracking-Scripts der Werbeindustrie filtern und dadurch die allgegenwärtige Überwachung des Surfverhaltens etwas lindern. Weiters kann man die FreedomBox als "persönlichen Datenspeicher" verwenden, was bedeutet dass man seine persönlichen Daten nicht mit unbekannten Risiken in der "Cloud" ablegt, sondern sicher und kontrolliert bei sich zu Hause. Das Ziel des FreedomBox-Projekts ist es letztlich, dezentrale Alternativen zu großen und sehr stark zentralisierten Internet-Diensten zu schaffen. Während des Workshops werden einige FreedomBoxen vorhanden sein, die selbst getestet werden können. Das FreedomBox-Projekt wurde aus der Überlegung geboren, dass stark zentralisierte Internet-Dienste wie Google und Facebook eine enorme Ansammlung von persönlichen Daten zur Folge haben, was wiederum zu Kontrolle, Macht und Missbrauchspotenzial führt. Von FreedomBox-Gründer Eben Moglen stammt der Ausspruch, dass Facebook inzwischen mehr Daten über Menschen gesammelt hat, als das alle totalitären Regimen das 20. Jahrhunderts geschafft haben. Das Weltwirtschaftsforum bezeichnet in einem Bericht persönliche Daten als das neue Öl des 21 Jahrhunderts. Die Europäische Union sieht persönliche Daten als potenzielle Quelle für einen Aufschwung und sogar Weg aus der Wirtschaftskrise. In manchen Ländern können persönliche Daten in den falschen Händen zu Folter und Tod führen. Netzpolitische Fragen rund um persönliche Daten sind hochaktuell. In diesen Bereich fallen zum Beispiel Themen wie die Vorratsdatenspeicherung und die Netzneutralität. Immer mehr Menschen haben das Gefühl, dass persönliche Daten im Internet weder vom Staat noch von kalifornischen Unternehmen abgefangen und ausgewertet werden sollten. Ein möglicher Ansatz scheint zu sein, dezentrale Netzwerke verschiedener Ausprägung zu schaffen, in denen entweder mehrere Dienstanbieter zur Auswahl stehen, oder sogar jeder Teilnehmer quasi nach dem BitTorrent-Prinzip sein eigener Anbieter sein kann. Dies ist das Ziel der FreedomBox. In einem solchen System ist Privatsphäre nicht nur ein Schlagwort, sondern tief in der technischen Architektur verankert. Inzwischen gibt es eine offizielle Version 0.1 der FreedomBox-Software, die z.B. Tracking-Scripts und Werbebanner mittels der Softwarepakete "Privoxy", "AdBlock Plus", und "HTTP Everywhere" filtern kann. The idea of the FreedomBox is to produce a small electronic device (a mini computer) that enables private, encrypted communication over the Internet. While the project is only at an early stage, there are many ideas and visions on what such a device could be used for, e.g. for avoiding surveillance and circumventing censorship. Myself, I have experimented with such ideas in the context of Project Danube, an open source project that has worked on decentralized communication for several years. This workshop will give a live demonstration of 4 Guruplug mini computers that can act as FreedomBoxes. 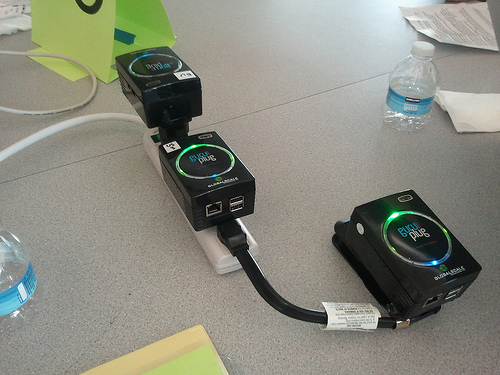 After plugging them into a power outlet, they will automatically connect to each other and form a peer-to-peer network. They can be controlled via a web interface. The peer-to-peer network makes it possible to send messages and share personal data between the Guruplugs. During the last few months, I have been to several conferences and demonstrated what such mini computers could be used for, e.g. at the Internet Identity Workshop in Mountain View, California, and at the European Identity Conference in Munich, Germany. The Guruplugs were handed out to volunteer participants and plugged into power outlets. Upon being plugged in, these small personal servers booted their Debian operating system and custom Project Danube demo software. The volunteer participants of the demo were able to control their box via a web interface. 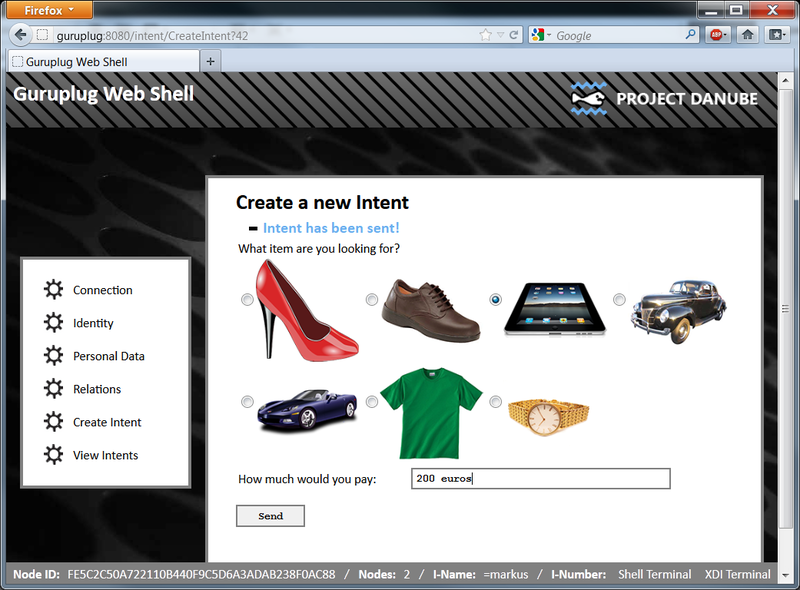 The first step to perform was to connect one’s box to the other boxes (using a button on the web interface). The second step was to sign in to the network with an identifier (using a Distributed Hash Table), in order for boxes to be able to find each other. 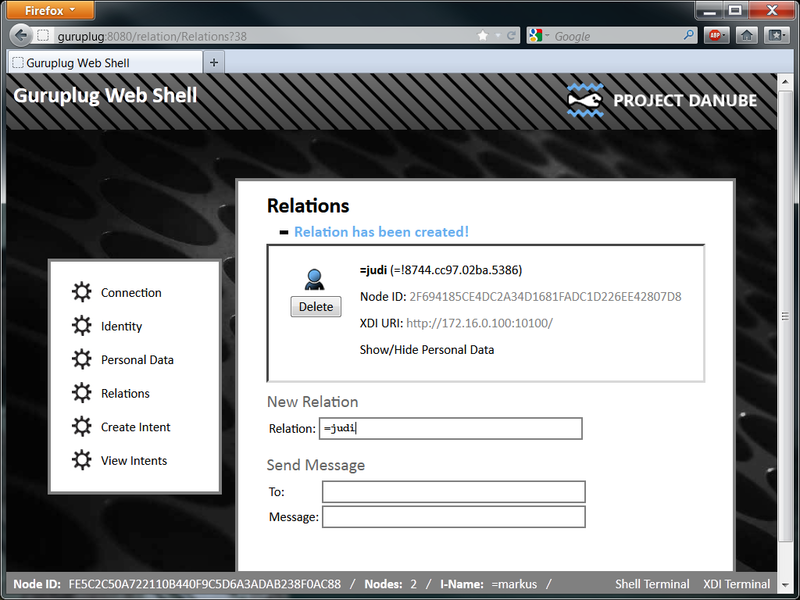 Establish a relationship with other participants, which allowed access to the personal data on their boxes via XDI Messaging. Sending text messages from one box to another. Sending an “intent” to all boxes on the network (via multicasting), indicating what one would be willing to buy at a given price. Viewing “intents” received from the network. During the workshop, we will perform the above steps. Attendants can borrow one of the Guruplugs and participate, and we can have a discussion on the technology and the potential uses of such a mini computer. 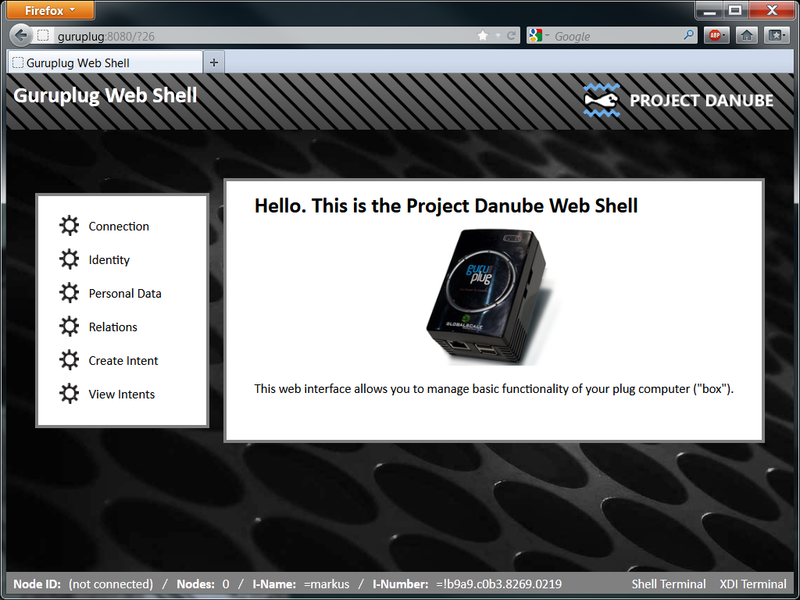 Project Danube is an open-source project offering software for identity and personal data services on the Internet. The core of this project is an XDI-based Personal Data Store - a semantic database for your personal data, which always remains under your control. Applications on top of this database include the Federated Social Web, the selective sharing of personal data with organizations, and experimental peer-to-peer communication architectures. The efforts of this project reflect ongoing discourse about political and social questions about anonymity vs. veronymity, centralization vs. decentralization, and the appropriate handling of personal data online.